Seiko Epson Corp. ("Epson") has announced that it has developed the world's first*1 flexible 8-bit asynchronous microprocessor using low-temperature polysilicon thin-film transistors (LTPS-TFTs) on a plastic substrate. With energy consumption reduced by 70% compared to the synchronous microprocessors now in everyday use, Epson is now researching potential applications for its invention. The results of Epson's research were announced at ISSCC2005, the International Solid-State Circuit Conference, held earlier this month in San Francisco in the United States. This CTCSS tone encoder was designed for use with my Kenwood TM201B 2m transceiver. It uses the most *inexpensive* microcontroller on the planet; AVR Tiny11-6PC. The microcontroller is an AVR core microcontroller with minimum number of peripherals. Although this micro has an in built 1 MHz oscillator, the micro is clocked using a 32KHz XTAL to generate a stable clock. The internal oscillator is not calibrated and the clock varies with voltage and the temp of the device. The unit is right now programmed to generate one tone but there is an option for four tones. The two IO pins of the micro are left aside for tone selection input. The tones can then be selected by the jumpers. The Kenwood TM201B transceiver has an option of adding a tone board TU-3. The module is hard to find and expensive. After doing a lot of digging, a Kenwood engineer helped me with the TU-3 Datasheet. Below is the schematic in PNG format. This is also available at github. I have posted an addition to this post at Gerbmerge errors for installing Gerbmerge on Ubuntu Linux (12.04-LTS). Although the instructions to install it on Linux are there on the above link but they didn't work quite well on my recent install because of Simpleparse. I contacted the author and he sent me the instructions to compile it. So here are they in a user friendly manner. I tinker code and hardware on various platforms and therefore I like to keep boundaries between development tools. I also would like to keep design re-usability among some common tools. To keep isolation between platforms, I use VMware workstation. To keep versions, I use git. Git can be used standalone (without a server) if you need. As you can see from the screenshot that I'm using code development and hardware development for PIC micro-controllers on one OS platform. 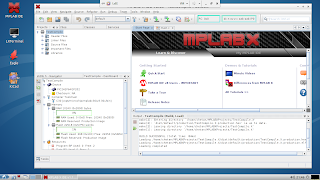 With release of MPLAB-X on Linux, PIC development is in "free" boundary. I don't have to dedicate a windows license for my PIC development. I have verified my ICD2 and PICKIT2 working under VMware workstation with MPLAB X. I saw some issues with MPLABX and C30 v3.30c but now fixed by MPLABX 1.30. The C30 issues were fixed by fixing the header files. I opened a ticket with Microchip so that they can fix those in newer versions.